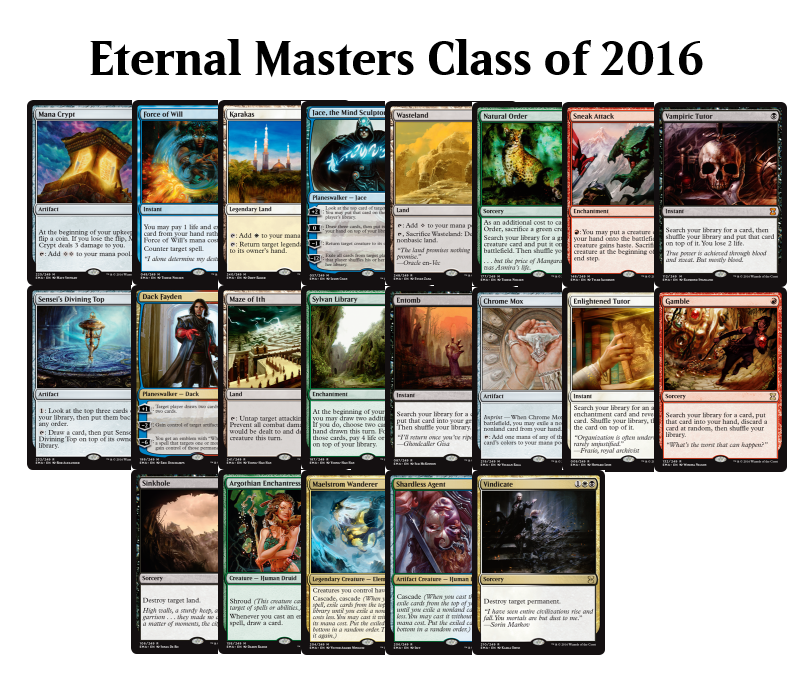 Ladies and Gentlemen, let’s welcome the Eternal Masters class of 2016. Otherwise known as the 21 cards currently pre-ordering for at least the cost of an Eternal Masters booster pack (at MSRP). That’s right guys, of the 53 rares and 15 mythics, only 10 rares and 11 mythics are worth at least the cost of a pack. But how does this compare to a normal set? 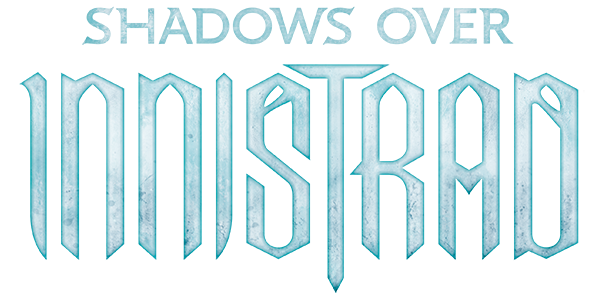 Currently (at retail prices) there are 24 cards in Shadows over Innistrad worth at least the cost of a booster (which for this exercise I assume is $3). Shadows over Innistrad is a little weird with it’s flip cards but the number of break even cards is roughly the same. What’s the problem then? Finding Eternal Masters boosters at MSRP. It is suggested, after all. Unfortunately (or fortunately, depending on how you look at it) Wizards of the Coast, a Hasbro subsidiary, can’t reprint expensive cards into oblivion. It gets brought up often, but, Wizards of the Coast, a non-Hasbro subsidiary, did that exactly once. Chronicles was a big problem and they are slowly trying to creep toward a middle ground. This set will be a lot like Modern Masters and kill the price of a few casual cards but otherwise not make a dent in the prices of decks it is supposed to help. The other issue with Masters sets is the need to “hold things back” for future Masters sets. Modern Masters 2015 was generally perceived as underwhelming by the majority of people although it was more widely available at MSRP. Without another round of reprints from the first set it was difficult to find enough new cards to print. At some point, if they find it too difficult to reduce the over lap in Masters sets we might just get full set reprints (ie Modern Masters released in 2019). These issues all culminate into a rather complex question: “How do we satisfy everyone?” I’m not sure there is an answer. Well some of these cards will likely fluctuate up and down but there are some I am sure will see a sharp decline going into the end of the year. All three of these cards made their debut in Planechase 2012. Coincidentally, Planechase Anthology has already been announced to be including the Planechase 2012 decks and all of the planes. 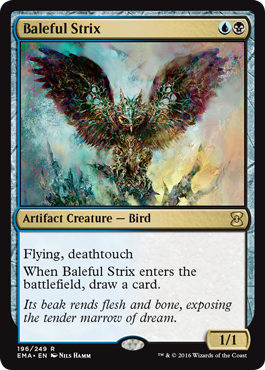 Baleful Strix has already been reprinted in one supplementary product so it’s already not very expensive but Shardless Agent and Maelstrom Wanderer will likely quickly fall from their $10 pre-order price. In fact, they may already be lower than $10 by the time this article is out. The great Commander resource website, EDHrec.com, was able to get me some data about the playability of Eternal Masters cards. Here is a dump of the frequency of cards from Eternal Masters in the decklists they parse. 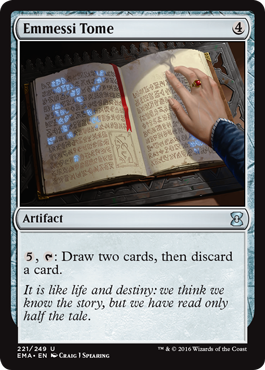 Unsurprisingly, Swords to Plowshares, Counterspell, and Sensei’s Divining Top are 3 of the most played cards in their study. They’re all extremely flexible, cheap, and powerful. I woudn’t be worried about the prices of any of those changing much (although foils might get a little cheaper with more copies). The biggest loser I can see on this list is Regal Force. 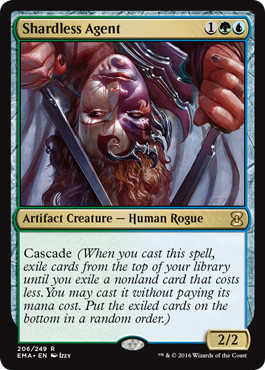 I expect this card’s price to take a bath similar to Adarkar Valkyrie. Once a nearly $10 card based mostly on rarity the tiny print run has brought Adarkar Valkyrie into basically bulk rare territory. 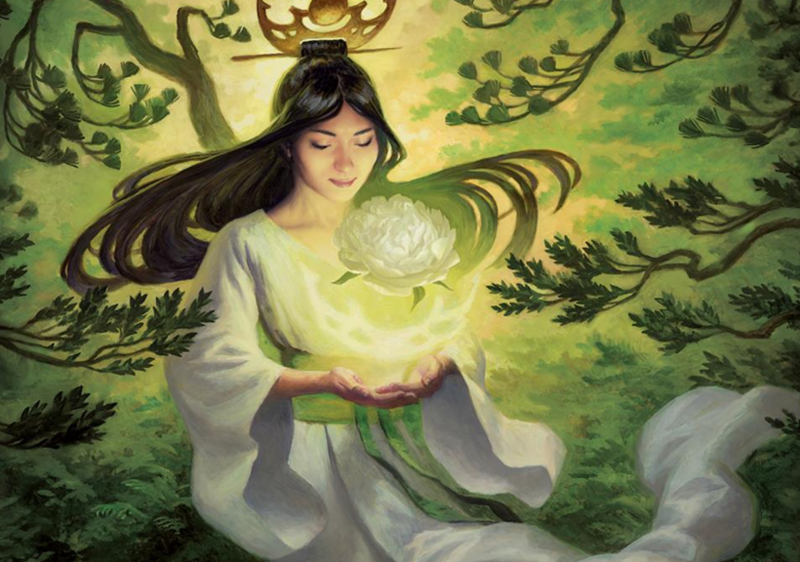 Commander players tend to be more casual and even though you don’t need to pay for the cards you put on your decklists online, many people leave out prohibitively expensive cards in large numbers. As a result I believe that we will not see much of a dip in the price of Mana Crypt. 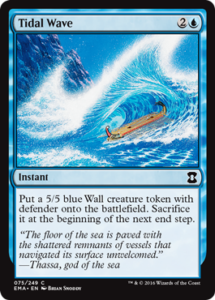 It’s functionally very similar to Sol Ring (the most popular card in Commander – beating the next card, Command Tower, by about 30%) so the appeal to own a copy or five for your Commander decks is pretty high. As a result, if the price drops any significant amount it will cross a lot of player’s thresholds into “purchasable.” Mana Crypt started pre-order pricing on StarCity Games for $50. As of this writing, it’s sold out at $90 which is just $30 less than the original printing. The original printing is also sold out so it’s unlikely the demand for these can be satisfied this time. 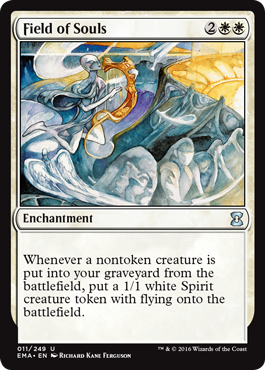 I’m expecting Mana Crypt to follow Tarmogoyf as the chase mythic in all Eternal Masters sets. Is it a little misleading that I’ve intentionally ignored the foil slot in calculating cards you can open in a booster pack to pay for it? Maybe a little. However, as of this writing, no stores have posted pre-order prices for foils. It’s possible they don’t know the math exactly on how little they plan to open for pre-orders or they just don’t want to be the first one to blink. The first store to set the prices of foils will be planting their flag in the ground and seeing if it sticks. 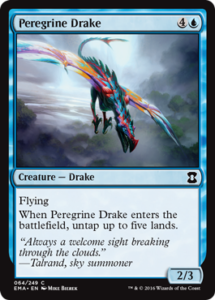 Some of these foils will be uncharted territory and it’s possible they could be leaving a lot of money on the table by being the first to sell out. Let’s do a little recap on first time foils. These cards all have original pack printings from Urza’s Saga or earlier. There were no foil cards in those packs yet. It’s unlikely any of these cards will light up any price graphs. Originally I had separated these into different groups. One group of Commander foils, one group of Pauper foils, one group of Vintage and Legacy foils, one group of Cube foils, etc. But I realized that breaking them down that way implies that there is no overlap and that’s just not true. These first time foils will be worth some order of magnitude more than than their non-foil counter part. Despite being an uncommon, I think Pyroblast foils will likely command the highest price tag on this list. 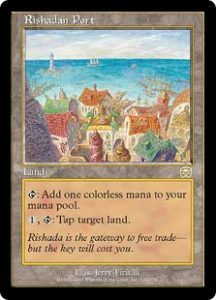 As many people have already become well aware, Rishadan Port was left off the reprint list this time. I don’t often talk about Magic Online but this miss hurts MTGO the most. 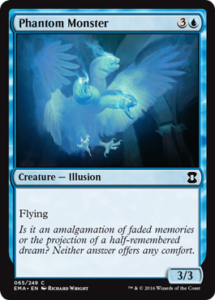 Rishadan Port was creeping down to about 150 tickets (1 ticket is about $1) while people feared a reprint but immediately shot up 50 tickets once it was announced to not be in the set. 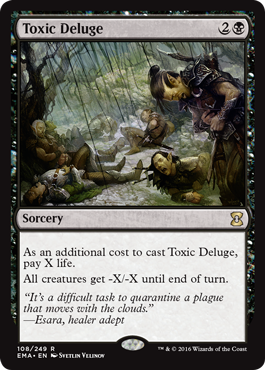 There is some incentive not to reprint Port again so quickly after it was just announced as a Judge foil but this one stings. Rishadan Port is part of one of the few Legacy decks that doesn’t use any reserve list cards (Death and Taxes). 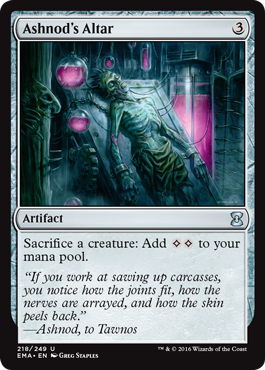 This card was likely selected to be held back for another Eternal Masters set in 2 years. 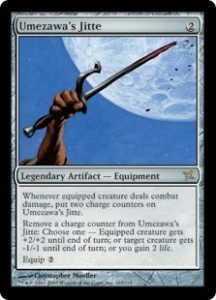 Umezawa’s Jitte is one of the best equipment ever printed and one of the few cards from Betrayer’s of Kamigawa worth talking about. 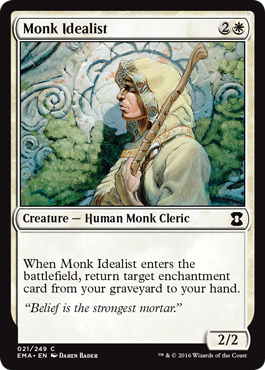 This card is not quite as pricey as a lot of things included in Eternal Masters but it’s a really hard card to reprint in a draftable set. Jitte is frequently seen as a one-man army type card that would almost assuredly be a mythic these days. Every time we get a set that can reprint Jitte and is evades another printing there is a possibility the price goes up. Umezawa’s Jitte has a GP Promo version but this was before full year promos. As a result only 6 months of Umezawa’s Jitte promos means there are not that many to go around. 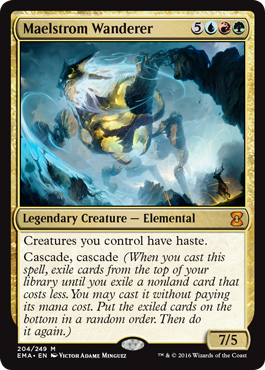 It’s only saving grace is you don’t often want more than one of this legendary equipment in your Legacy deck. 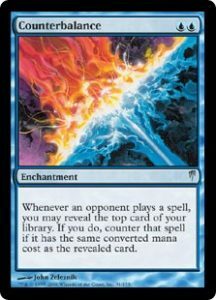 Flusterstorm is a card that was “printed” many times online but only twice in paper. Currently your choices for Flusterstorms in paper are the original Commander printing or judge foils. 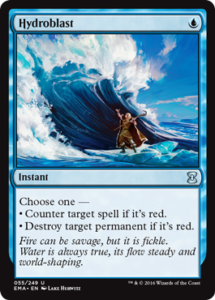 At a minimum of almost $60, it’s fair to say Flusterstorm should be on Wizard’s radar for a reprint. It’s possible that it still is on track to get reprinted this year. Conspiracy: Take the Crown is going to be released in two short months and could include some Legacy and Vintage reprints with multiplayer applicability. 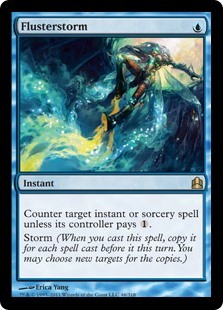 Flusterstorm’s Storm ability plays nicely with a 4 player game (as it was originally intended as a Commander counter spell). I’m not saying it’s likely, but its possible we get Flusterstorm in Conspiracy: Take the Crown. 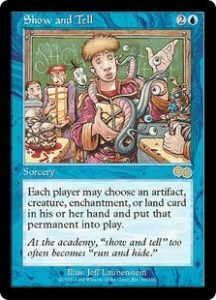 Show and Tell is a wonderful card. It’s wonderfully pricey and part of two Legacy decks that don’t lean heavily on the reserve list (Sneak and Show and Reanimator). It’s also the card that I am most surprised is missing. 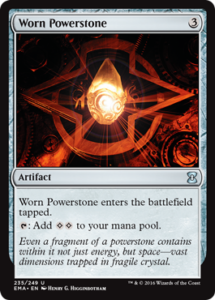 If there is anything they could leave out of Eternal Masters to be in Conspiracy: Take the Crown it’s Show and Tell. 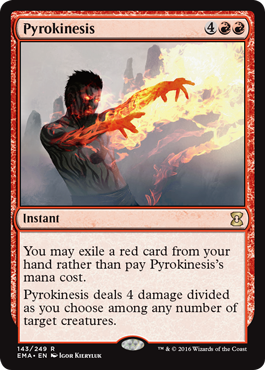 That card is easy to put into a draft set because you can control the worst thing put into play. It also plays pretty nicely with a multiplayer game. 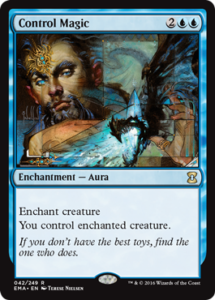 I just hope if it get’s reprinted they use the Urza’s Saga art. Nothing against Zack Stella, but this one is so much cuter. These last two are not terribly expensive, yet. I would have expected them to get a reprint to help ease the price while it’s not high. 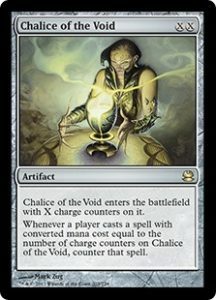 Wizards has shown reluctance to reprint very expensive cards close to their original rarity especially if they can be detrimental to a draft format. 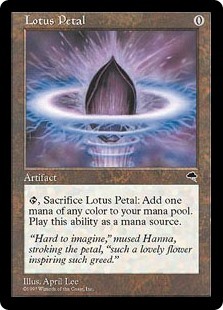 I’m guessing when we see a Lotus Petal reprint it won’t be at common. 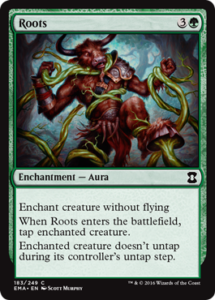 Some cards are notably missing from Eternal Masters but I would never expect them to print in an Eternal set. Aether Vial, Chalice of the Void, Damnation, and Snapcaster Mage are all Modern cards first and foremost. 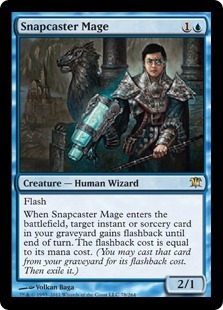 If we get those in a Masters set, it will be Modern Masters not Eternal Masters. I know every set goes by and people wonder if we’ll ever get Damnation again. I’m sure it will come eventually and it will be in a Modern Masters set. 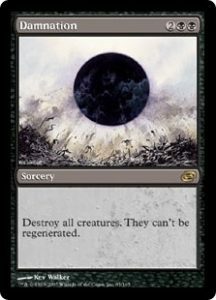 We just got the full spoiler for Eternal Masters and we’re about to hit the ground running with Eldritch Moon spoilers. 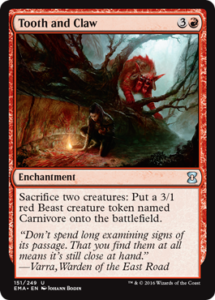 Generally for Standard sets, spoilers last for two weeks and end the week before the pre-release. 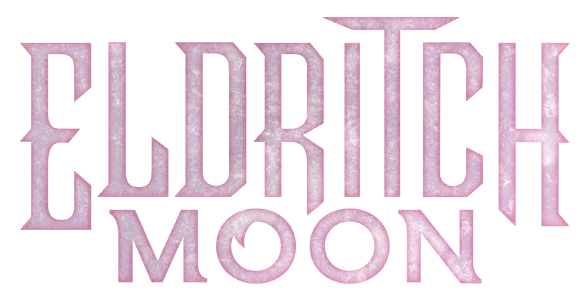 Based on this, Eldritch Moon spoilers should start in about 3 weeks, on June 27th. Eternal Masters will have been released for 17 days before spoilers for the next set start. 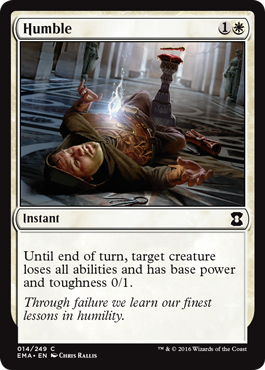 I’m expecting some Magic fatigue in the worst kind of way. 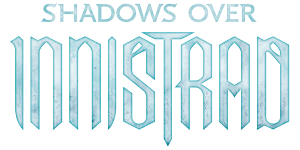 Have you been paying attention to the card prices for Shadows over Innistrad? They’re reaching near time lows. 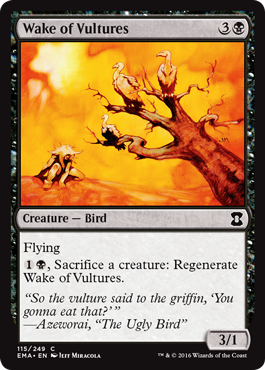 When the spoilers start for Eldritch Moon people will begin to buy more as they get re-excited for Standard. If you’ve been waiting for some prices to go down before they rise again you’re nearing the best times until the late summer. How about including Imperial Seal on the next Eternal Masters? 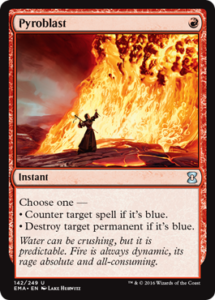 I imagine that is more likely to be a judge foil before an Eternal Masters card. That’s going to have to be at an expeditions-type rarity I think. How do you reprint something so absurdly expensive and not crater the price? Yea, imagine the uproar of tanking a $800 card. I was hoping pretty hard for a crucible if world’s in EMA. I thought it seemed like a great time with the frog horror from SoI and 4 color commander comin soon. Do you think we will see it anytime soon? That’s another card like Damnation that I feel like they want to save for the “right time.” I don’t think 4c Commander decks are a good place to put it. Maybe Modern Masters next year? I don’t see it in an Eternal Masters set. 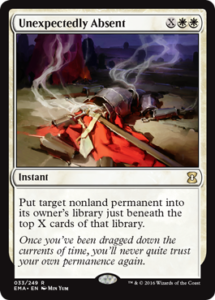 All portal cards and brutally Grim Tutor. 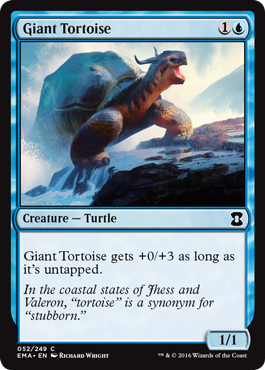 That is a good, viable card in storm and really needs a reprint out of Starter. Genesis would have made a sweet reprint. 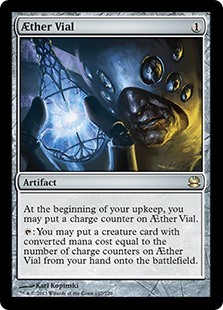 Phyrexian Altar, I was hoping to see in Eternal Masters but with the announcement that Commander 2016 going to be four colors. I still have hope for a recent reprint (new art would be a bonus). Oh yeah, they should definitely include Mana Drain in the next Eternal Masters! It’s not even in the Reserved List! When will be the best time to buy into SOI cards that can be good in modern? Late June or late summer? 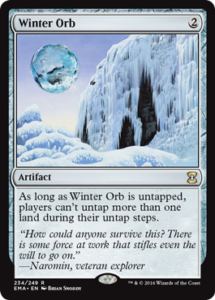 I was thinking to buy cards like Titi in the summer hoping that it doesn’t show up a lot in modern until then. But I’m afraid that some cards could have a price trajectory similar to CoCo’s one or Kolaghan’s Command’s one. In that case the best time would be now.